Disclaimer: For those who haven’t yet got their hands on the latest (for reasons, I do not call it the last) Harry Potter book, do NOT read on. This blog will act as a spoiler. For those who have…go right ahead! J.K.Rowling has finally proven herself. Harry Potter and the Deathly Hallows is just pure brilliant. This one book has transformed the series from a set of individual stories into one long interwoven spell. Like a true Hindi film, the book has all the elements of success – drama, love, sacrifice, friendship, betrayal and the one constant of good wins over evil. Probably one of the few books which evoke emotions (Like the melancholy ending of Love story or the humor of Inscrutable Amricans), I would have been the saddest person if Harry had died in this book. Not for any other reason, but it would have proven that he was the boy who lived merely out of luck. But thankfully it is not to be. The boy lives on…and with him lives our hope of a better tomorrow. Not revealing too much of the plot, I believe that the best part of this book versus its predecessors are the twists and turns in the story that Rowling managed to weave. You never know where the plot is leading to. Its also interesting how she portrayed the shades of dark in the greatest wizard – Dumbledore, defying the fairy tale logic of black and white. There is a little dark in all of us. The difference, as Dumbledore says, is what part of us we choose to follow. And as I recently told a friend of mine, this book has done the impossible. 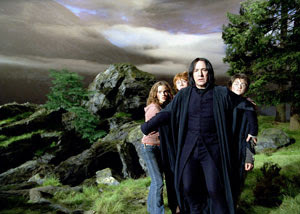 It actually made me fall in love with Severus Snape. He emerges out of this book as the hero of all times. The one who lost his love but yet dedicated his life to protect her son. His story, seen in the pensieve was heart wrenching. Somehow, he doesn’t evoke sympathy or pity at the end of all this. He evokes empathy and love and awe. A moment of silence to honor a man who lived and died with dignity! Slightly disappointing was how Voldemort died quite an uneventful death in the end. One would have expected the greatest dark wizard to go down dramatically, but it was not so. But Rowling, never failing to please, added the twist about the wands in the final duel, over-shadowing any lack of drama. As most Potter fans, I wait with bated breath for the next one.. and hope like hell that there is a next one. Perhaps it’s little Albus Severus who takes on the role… who knows what Rowling has in store for us in the future. Kudos to a woman who imagined this world of magic, a world that seems more real than ours and makes us ache to be a part of it. A world which shall for years to come, be talked about with the same awe that before only Enid Blyton deserved. Good review...like a true fan. :) Love Snape too... shouldn't have died. you write so well! hopefully we'll get to read you in mainstream print media!!! :) Excellent review!